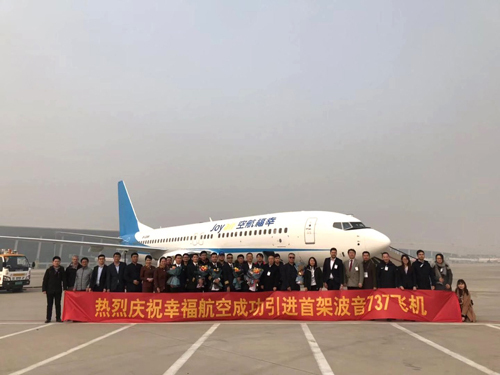 AviaAM Leasing, a global aviation holding company engaged in tailored aircraft leasing, reconfiguration and trading services, has announced that its Joint Venture company with the state-owned company Henan Civil Aviation Development and Investment Company (HNCA) – AviaAM Financial Leasing China – has recently delivered its second brand-new Boeing 737-800 aircraft to the Chinese customers. On 17th of December 2018, an aircraft MSN 60467 left the Boeing assembly line in Seattle, the United States, and took off to the Zhengzhou Airport Economy Zone (Zhengzhou Xinzheng Comprehensive Bonded Zone), where it was officially delivered to its new operator on 21st of December 2018. Aircraft equipped by 186 economy seats and 2* CFM56-7B26E engines is co-leased to Okay Airways and Joy Air under the 12 years agreement. A brand-new Boeing aircraft will be the first narrow-body in Joy Air fleet. This is already the second aircraft delivered by AviaAM Financial Leasing China to Chinese carrier. First one was leased to Okay Airways in September last year. “This project is a significant step for our Joint Venture company which has not only opened doors to fast-growing Chinese market, but successfully widened the list of the domestic clients. We appreciate that such reputable partner selected us among the other companies on the market. Our team is actively working on to continue aircraft leasing industry development in Henan Province, China and the other One Belt One Road countries.” – says Tadas Goberis, CEO and Chairman of the Board of AviaAM Leasing and Board Member of AviaAM Financial Leasing China Co., Ltd.
“We are glad to start our cooperation with such reputable aircraft leasing company as AviaAM Financial Leasing China. This delivery is extremely important for our company as it will be the first narrow-body aircraft in our fleet, but we are absolutely convinced that it is only the beginning of our great cooperation with this lessor”, said Jing Han, Vice President of Joy Air. Next PostAirlines go bankrupt: will you make it home for Holidays?